Recently, Facebook has restricted the ability to use characters more than one alphabet (usually symbols or Chinese characters) in their name. So, if you have second language or symbols in your name other than English, you should have noticed that Facebook requires you to change your name accordingly using only English alphabets. Your profile name may not contain characters from more than one alphabet. If you’d like to list your name in a second language, please use the Alternate Name field. So, how do I add second language such as Chinese characters into my name? However, some users reported that Facebook has approved their names which contains only Chinese characters in the first, middle and last name. So, if you think that Chinese name should come first before your English name (or perhaps just a nickname), you can try to set your Chinese name as your Full Name (first, middle and last name) and English name as your Alternate Name. Also, please be warned that Facebook will ban your ability to change your name on your FB profile page if you’ve made too many changes. If you are unfortunate enough to be banned, please check out: how to fix “Your name change request has been rejected by our automated approval system”. Where is the settings to change your name? 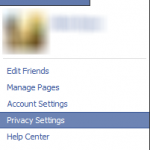 To change your Facebook profile full name, login to Facebook. Click on the setting icon on the upper right site of the screen and then select “Settings”. Click on “General” from the left column. In the Name section, click Edit. Fill in your name and hit Save changes. It’s also worth noting that you will be restricted from any name changes in the next 60 days after every change. You are also not allowed to use any punctuation or random characters in any of the first, middle and last name. Well, it doesn’t make sense to use some messy names for your Facebook profile. So, think twice before making any changes. If you’re making a change for your name, you may also want to change your Facebook username. This username is not the name that represents you, but it will be your login ID and the name Facebook will use to craft a unique URL for your profile page. Click Edit from the Username section to change your username.